Birthplace: Palmerston North, New Zealand. Bruce Cribb spent six seasons at Dudley Wood, arriving in 1973 from Exeter as a quality nine-point man and departing in July 1978 after carving out a highly respectable reputation in the Heathens' History. He wore the Number 1 race-jacket, took over the honour of the captain's role, and made many friends during his stay. 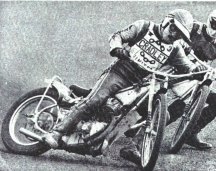 Cribby had arrived on UK shores in August 1965 to ride for Poole in the inaugural season of the British League. He was still only 19 years old, with just over two years of speedway experience behind him, and it took a while to adjust to the pace of racing over here. However, by the time Poole won the league championship in 1969, he was a regular seven-point man and after switching to Exeter in the same year he quickly established himself as a heatleader too. During his four years at the County Ground, he rode for the New Zealand test team against England, represented Great Britain against Poland and won the New Zealand Championship. Bruce had made a name for himself as a speedway rider, to add to his schools level caps in Rugby Union, Cricket, Athletics and Swimming. It wasn't all easy going though when the big Kiwi eventually came to ride for Cradley. He had a relatively slow start, other than a couple of 9 and 10 point scores, before breaking his leg in a first bend pile up against Oxford in June '73. He missed the rest of the season, returned for the beginning of the following year, but struggled to regain his confidence. There were a few problems with inconsistency and a string of mechanical problems, mixed with some fantastic team riding ability and occasional flashes of brilliance. Gradually, there came a steady improvement and in 1976, Cribby was named as captain as he became a solid third heatleader behind John Boulger and Bernie Persson. At his best, ne notched 17+1 from seven rides against Swindon in 1976, as well as over fifty more double-figure returns. Many will remember his 14 points in a 1974 World Championship Qualifier at Dudley Wood; an aggregate 33 point haul in the two legs of the 1977 Midland Cup Final against Coventry; or the unusual feat of taking eight rides, also against the Bees with the new rider replacement rule of 1976. With his ups and downs, he had a spell at reserve in May '77 and then started the following season wearing the coveted No.1 riding slot. For the most part of these two years, he was a reliable second string and integral part of the team, but as the Dudley Wood setup entered a period of enormous transformation under Dan McCormick, Bruce announced his decision to leave. He was transfer listed in June 1978 and eventually left for Bristol amidst the wheeling and dealing that led to the Heathens' transfer record acquisition of Phil Collins in July. At the same time as making a name for himself as an Ice Speedway racer, he didn't spend long at Bristol before heading back to the Midlands for two years at Wolves, a spell at Oxford and then a swift return to Monmore in 1981. This was followed by four years sterling service in the National League with Berwick and even an eventual return to his second club, Exeter in 1986. His last performance on the Dudley Wood track was on his terrifying ice bike, complete with spiked tyres, in a unique track record attempt during Erik Gundersen's testimonial meeting. + When Bruce first started speedway in his native New Zealand, his father was one one of the local stars (Kiwi Cribb). He first shared a bike with his Dad and the programme had to be worked out so that they could be kept apart! When he did finally get a bike of his own, the first time they met Bruce shoved him into the fence. Kiwi said when it comes to being knocked off by your own son it's time to pack up and he did! + It was on 19th April 1976 at Brandon when Cribby achieved the remarkable feat of taking eight rides in match, and it remains the only occasion that any Cradley rider has ever taken so many outings in one meeting. It occurred partly thanks due to an injury picked up by John Boulger three nights earlier and meant that Bruce was out in heats 3, 5, 7, 8, 10, 11, 12 and 13. Remember, it was only a 13-heat formula so that was all but five races and the last four in succession. The local Express & Star reported that he finished last in his final two races "because his tyre was so worn out"! Bruce has also ran a motorcyle service repair shop until a year ago when he retired, although sometimes still help a BMW endurance car race team. He is always a regular at Cradley new era at Monmore Green and Perry Barr and attends most social events.